Changes in Auburn gameday attire will be seen seen in the stands as well as on the field. 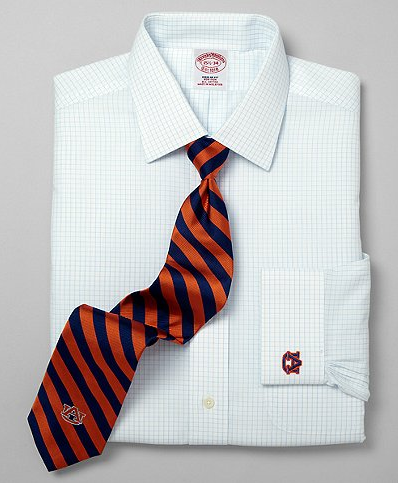 Brooks Brothers’ Collegiate collection has finally found its way into stores. Auburn is one of fifteen inaugural schools represented in the new line, the reputation Auburn men have for dressing to kill obviously preceding us. 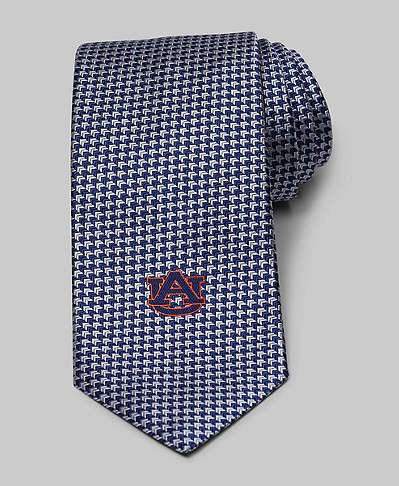 The collection features five new products specially tailored for gameday, including, of course, the necktie… in three variations. Two dress shirts feature the interlocking AU on the cuff. One is a lightweight BrooksCool shirt in blue with a button down collar that will wear well any time of the year. The second is a light blue check with an Ainsley collar that will likely pull double duty at the office during the week. 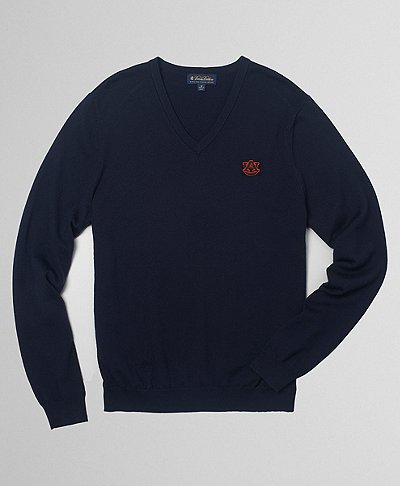 Extending the line to the end of the season is a v-neck Merino sweater in navy that will pair with either of the shirts and will look great with or without a tie. And finally we have a Golden Fleece Performance Polo available in navy and white for early season games… and a round of golf. Our take? Anyone that owns a Brooks Brothers item knows you get what you pay for. The fit, fabric, and quality of construction is second to none. 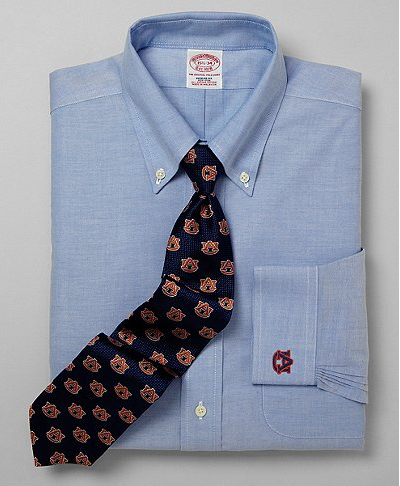 Brooks Brothers is bringing a level of quality into gameday gear that has been missing and will be well appreciated. Sure, you could get a less expensive shirt somewhere else but not only do these shirts look and fit better, they’ll also last and be in style for years to come. Word is that the Collegiate collection will not only be sold in Brooks Brothers stores and online but also in other retail outlets. 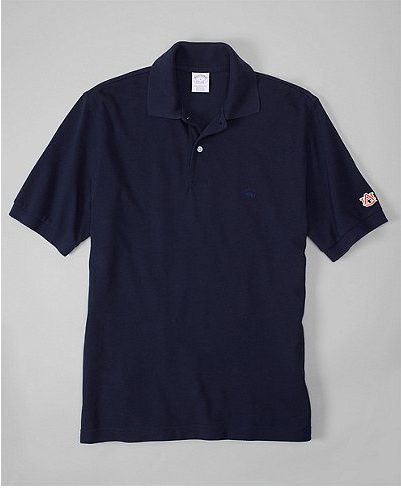 We also hopefully expect to see more items added in the coming months, including a possible contribution from Auburn Alum, K. Cooper Ray via his Social Primer partnership with Brooks Brothers. Follow Todd Hollinghead on Twitter. Related: An (Auburn) houndstooth hat? No worries. It’s not a true houndstooth. It’s safe to wear. thank the good Lord there is no redneck looking houndstooth in there – the bammers have completely ruined a fashion pattern for the rest of the world. Great classic pieces that will stand the test of time. Brooks Brothers’ quality is top notch; I would definitely purchase these items from them. Also a big fan of the cuff embroidery. Their corporate discount is also a nice touch. This isn’t hound’s tooth. It’s herringbone.